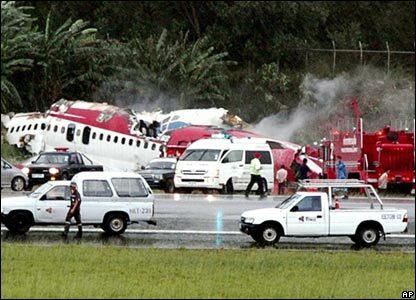 At least 90 people are killed when thebudget airline flight with 130 people aboard crashed on landing at Phuket airport in heavy rains and strong winds yesterday. Flight OG 269, operated by airline One-Two-Go, had flown to Phuket from the Thai capital, Bangkok. As many as 42 people are injured out of which many are in serious condition. I haven’t updated this site for a very long time now. But yesterday’s air crash shook me badly. After the tsunami which hit a couple of years ago in Phuket, disaster struck this region again. This air crash is Thailand’s deadliest aviation accident since December 1998, when 101 people were killed after a Thai Airways crashed in similar fashion near the southern region. I wish the survivors the very best to get well soon. Our prayers are with you. This entry was posted in Bangkok Airport on September 17, 2007 by Bangkok Boy.